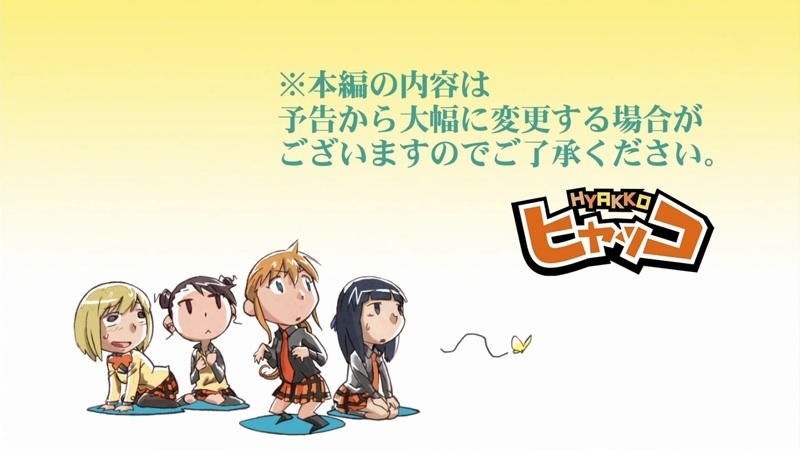 Episode 6 of Hyakko, “Tiger on both sides of three houses over there”, begins with Torako, Suzume, and Ayumi hurrying off somewhere when school ends. Tatsuki feels somewhat excluded, despite being annoyed by Torako the other times she was dragged somewhere, as she thinks to herself. Or actually, Nene narrating what Torako should be thinking, which annoys Tatsuki eventually. As Tatsuki takes her sweet time returning home, she continuously oscillates between feeling lonely and telling herself she’s fine with being excluded, as she reflects on how she always used to walk alone when younger and how she’s always pestered by Torako, flustered by Suzume’s antics, and softened by Ayumi. It’s actually such a big concern for her that she returns home rather later than usual, and yet she still hasn’t reached any conclusion as she returns a bit frazzled. So she’s rather flabbergasted when she finds Torako, Suzume, and Ayumi in her room. They just dropped in for no particular reason except that Tatsuki is a friend, which kind of warms her heart. It’s also pretty stressful for her as a lot of embarrassing stuff are exposed, such as the photo album Torako enthusiastically browses through, and an envious Suzu who yearns to wear underwear like the ones Tatsuki has. And Ayumi isn’t too much help, as Torako uses Ayumi’s innocent charms effectively to defend herself against Tatsuki. At least their visit makes Tatsuki’s housekeeper Toshiko rather happy. Toshiko, who did most of the work raising Tatsuki as her parents are usually in Tokyo managing their corporation, invites the rest of the gang to stay for dinner. Torako and Suzume are enthusiastic about it, especially since the cookies Toshiko offered earlier were really good. And like when they were eating cookies, the personality of each character is reflected in how they eat dinner, with a shiny-eyed Suzume inhaling food, Torako annoying Tatsuki every once in a while, and Ayumi apologizing for the bother. When it comes time for Torako, Suzume, and Ayumi to go back to their own homes, their visit had made Toshiko so happy about Tatsuki’s friends visiting that she even prepared souvenirs for them, which Torako and Suzu receive enthusiastically. But even through all the annoyances and embarrassment, Tatsuki concludes overall that it was a good day as she reflects on her friendship with the other three girls, at which point the episode ends. After the ending credits, we start seeing a very long preview for the next episode, in a confusing amalgam various genres. I have no idea what the preview is all about (fake Suzume? ): all I get out of it is an amusing, dramatic, action-oriented plot. Besides, anything I say about the preview for the next episode might be a lot different from the actual plot: the show producers put up an explicit disclaimer that warns us there are cases where the preview can have little resemblance to the episode it’s previewing.